You see tons of recipes online for smoked salmon but very little for smoked steelhead. I adapted this recipe for Salmon and it must have worked because my 7 year old said it was "A thousand times amazing!". The recipe is from pelletheads.com memeber MikeMcQ (you can see it here: http://pelletheads.com/index.php?topic=30197.msg256886#msg256886). I have to agree with my daughter, this did turn out very good: sweet and not too salty with a little bit of a garlic bite. I was a little surprised that dill was in the recipe but it was very subtle and added a nice meaty flavor... dill and maple syrup, who would have thought? I left the skin on the trout which is a deviation from Mike's recipe but I felt that the trout would have fallen apart witout the skin. The skin actually crisped up very nice and is perfectly edible if you like it. 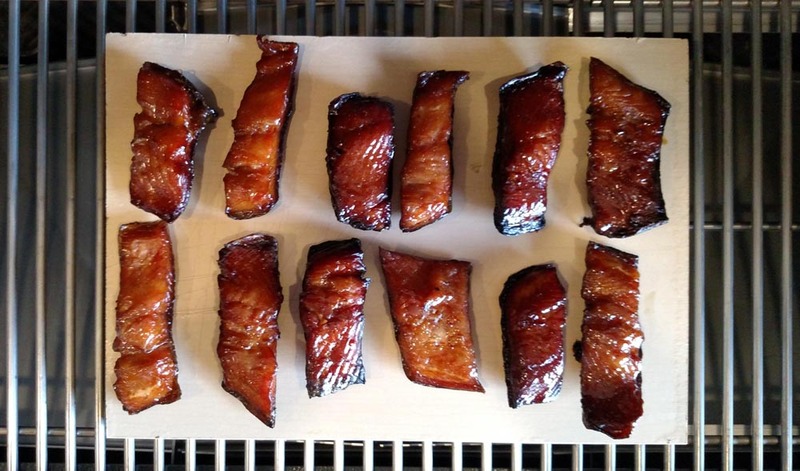 I like my smoked fish a little on the dry side (a bit like jerky) so I smoked this for 4 hours at 180° and then finished it with the maple glaze at 200° for 2 hours until it reached 160° internal. We had some of this trout grilled fresh last night on the Kuma grill but if you brine it and slather it in a maple glaze...."A thousand times amazing". I've done something very similar but using a smoke tube for the first 2-3 hours. I dry brine with equal parts brown sugar to Kosher salt for several hours in the refrigerator followed by placing near a fan with an open window for 2 hours till glazed. After that I baste with Maple Honey every 1 hour for the 3 hours of smoke at 180 on the Kuma. Our Coho run this summer in Alaska was very healthy so have been able to perfect my method to my families liking. Loving our Kuma, thank you for making such a quality product.